Dr. R.C. 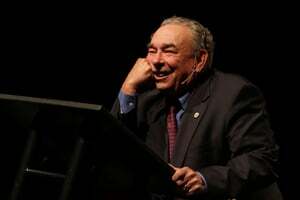 Sproul is recognized throughout the church for his articulate and winsome proclamation of the holiness of God and other essential doctrines of the Christian faith. As the founder and president of Ligonier Ministries, his teaching can be heard worldwide on the program Renewing Your Mind, which is available on 230 radio outlets in the United States and in fifty countries worldwide. Dr. Sproul also serves as the senior minister of preaching and teaching at Saint Andrew’s in Sanford, Fla., and has authored over sixty books including The Holiness of God, The Truth of the Cross, Truths We Confess, and The Lightlings. This morning Dr. Sproul addressed the conference on the two age-old questions: What is evil? and What is its origin? Evil is not. Because evil is nothing. Lest you think that I’ve fallen into Christian science (which is neither Christian nor science), I am not altogether denying the reality of evil. So what do I mean when I say that evil is nothing? I mean that evil is no thing. In our culture we get the idea that evil is some sort of independent substance, that evil exists in and of itself and that it influences the affairs of our life and of this world. But evil is not a thing that has existence. Evil has no being. It has no ontological status. Rather evil is an action of something that is a thing. I am something, you are something, and when I do something that is not good, then I am doing something that is evil. Evil, then, is the activity of a being. But it itself has no being. Historically, the two philosophers that addressed the idea of evil are Aquinas and Augustine. They used two latin words which translate into the English language as negation and privation. In philosophy, we commonly try to give definitions for mysteries by means of negotiation. In other words, we talk about what something is not. For example, we say God is infinite. What we mean is that He is not finite. This is an example of using the way of negation to describe God. Likewise, we must first understand what evil is not. We say things like “ungodliness”, “unrighteousness”, and “injustice” – we think of these three terms as being the opposite of the positive term godliness, righteousness, and justice. Evil is parasitic — it can only be known relative to the positive. The parasite depends on the host for its existence. You can’t really define or describe evil except against the background of good. A privation is some sort of lack or deficiency. If you don’t get something that you want, that does not mean you are experiencing depravation. But when you don’t get something you need, then it can be said that you are being deprived of something that you need for your being. In the Westminster Catechism, we’re asked “What is sin?” And we’re told that sin is any “want of conformity to or transgression of the law of God”. Sin is described as a privation, as a want or a lack of conformity to the standards that God has set for righteousness. Sin is a privation (a want of conformity to) to the law of God. But sin can also be a trasgression of the law of God. The latter is an addition that the reformers made to the categories derived from Aquinas and Augustine.They did so to avoid the impression that evil is merely an illusion. They wanted people to understand that evil is an activated disobedience to the law of God. Evil is a reality wreaks distruction. lest anyone think that just because evil has no being, they don’t want people to think that evil is a mere illusion. So they added two terms: actuosa (and ACTIVATED privation) an ACTIVATED disobedience to the law of God. Because evil is a reality that wreaks destruction. If God is holy, how did evil come about? In our culture, we have the phrase “Achilles’ heel.” It refers to the point of vulnerability. Skeptics say that the existence of evil is the “Achilles’ heel” of our claim to faith. John Stuart Mill was among those who articulated the problem of evil. Namely if God is omnipotent, but also all-loving and all-good, then why would such a God allow evil to persist in His universe? Mill thought such a God was contradictory. However, there is an adequate answer to this query. But before I can give that answer, I have to answer the question: Where did evil come from? And the answer is: I don’t know. But I’d like to tell you why I don’t know! The word theodicy is a word that comes from a combination of two biblical words: Theos (GOD) and Dikios (JUSTIFCATION). A theodicy is an intellectual, reasoned defense for God’s existence in a world containing evil. Lots of thinkers have developed theodicies over the years, but I have never found one that fully satisfied me. Before at the end of this talk I will give you the one that I think is the very best one, even though it is not fully satisfying. Most theodicies don’t fully grasp with the depth of the problem. They are simplistic. The most frequent answer says that evil is located in human free will. The one who brings evil into being is exercising the faculty of choosing (a faculty given to them by God). Just as Lucifer (a fallen angel) went from being good to being evil when he exercised his free will to disobey God. The problem that prior to evil choices being made, a creature must have some sort of an inclination to evil. Some have come up with the concept of “concupicience” — something which is of sin and which inclines to sin but itself is not sin. That seems clever, but the problem is that whatever is of sin and inclines to sin is sin. It would seem to me that a being with an inclination to sin is sinful. If you say that a creature commits sin arbitrarily, you deny the free agency of the creature. Eve’s theodicy was “the devil made me do it.” Adam’s theodicy was “the woman you gave me, she made me do it.” But if evil entered the garden by the coercion of Satan, if Adam and Eve were powerless to resist the temptation of Satan, then Adam and Eve would be excusable and not culpable. Now it is true that Satan is described as the most clever of beings. He tricked Eve. Some say that she falls into sin out of ignorance. If she really were completely ignorant, then she would not be guilty. In addition, the biblical text makes it clear that God told them what not to do. They were fully aware of God’s requirement. They were not ignorant. The serpent directly challenged God’s explicit instruction: “You will not surely die.” God had said, “You shall surely die.” Now Eve was unfallen. She had fully functional mental faculties. Eve should have recognized the law of non-contradiction. God says “If you do A, then B will follow.” The serpent says, “If you do A, then non-B will follow.” These are contradictory statements! Our forefathers were aware that they were following the serpent’s instruction, which violated that of God’s instruction. Barth called the origin of evil a “non-possible possibility.” But that’s obviously contradictory. Leibniz differentiated between meta-physical evil and physical evil. The latter is the Katrina flooding, for example. Leibniz’ argument goes like this: God is perfect in all of His attributes. Even God cannot create another God because the second God would be a creature – He would be eternally dependent on the first God. Thus, any creature that God creates must be less than He is. The world, said Leibniz, must be meta-physcially imperfect because it is less than God. So meta-physical evil is inevitable in a world which is less than God, and this meta-physical evil gives rise to physical evil. And meta-physical evil together with physical evil give rise to moral evil. Process theologians have followed this way of thinking. Many go this way. But if sin is a necessary consequence of being finite, then it is excusable and God could not find fault. Now, the Bible says it is sin to call good evil. When we say that God’s moral law is bad, we are saying that good is evil. So hear me well: Evil is not good, but it is good that there is evil. Otherwise, it would not be found in a world governed by a perfect God. God ordained that evil would come into being. Because evil things are working for good. Romans 8:28 could not be true unless God has ultimate power over evil. God ordained that evil would come into this world. Not naively, so that we would know the difference between good and evil, but for the sake of His redemptive purposes. When Joseph meets his brothers in Egypt, he says: “I’m not God. I know what you did. I know what your intentions were as moral creatures. But God meant it (the very same thing) for good” (Gen. 50:20). The same applies to good Friday. Though the intentions and acts of those collaborating to kill Jesus were evil (and they are accountable for their actions), God orchestrated (foreordained) and used it for a good purpose. Though I don’t know or fully understand the origin of evil, I do know evil’s future. God will rid the world of all meta-physical, physical, and moral evil. We look forward to that day, in which the new heavens and the new earth will be established. A world with no evil.